A cute milk white bottle with a purple twist-off lid and purple and silver tear-drop shaped label. 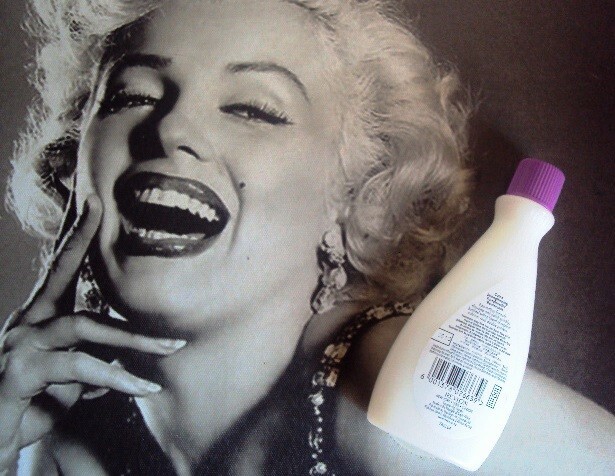 The nail varnish remover is also milky white in colour. Does what its suppose to and doesn't irritate my skin. I have contact dermatitis, so skin irritants is huge factor for me. This product works wonderfully to remover stubborn nail polish especially in a hurry and they also have one for sensitive skin which is great! This has been my family’s trusted nail polisher remover for MANY years. I can’t imagine using anything else. I particularly love this one because it’s very tough when it comes to removing stubborn nail polish colors like your red. My nails are visibly strong and healthy from using this product. The only downfall is that it’s very drying when it comes to the cuticles and sometimes the nail as well so I usually either wash my hands or moisturizer them after using it. A very popular nail polish remover that is widely available which makes it really convenient. Overall it removes nail polish well, although I find it struggles with some of the glitter varieties. It does tend to leave my nails a bit dry afterwards but a quick application of hand and nail cream always fixes that. Will continue purchasing it happily. One of the most affordable and effective nail varnish remover I have ever come across. If you want something that is affordable yet effective, don't look back. 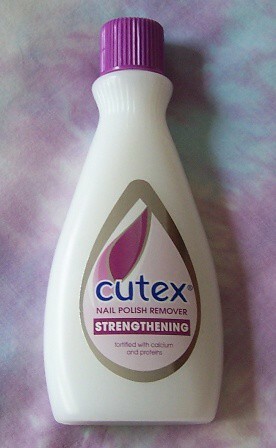 Cutex Nail Polish Remover: Strengthening is tough on cleaning whilst gentle on my nails. t works as if magically removing old untidy nail polish leaving my nails clean, smelling fresh and looking healthy. I have been using this brand since i started doing diy manicures. My granny always used it so I use to use some of hers until I started working and bought my own. It takes the nail polish off with ease and the smell isn't overbearing. This is really one of the oldest products I know and used in my life. 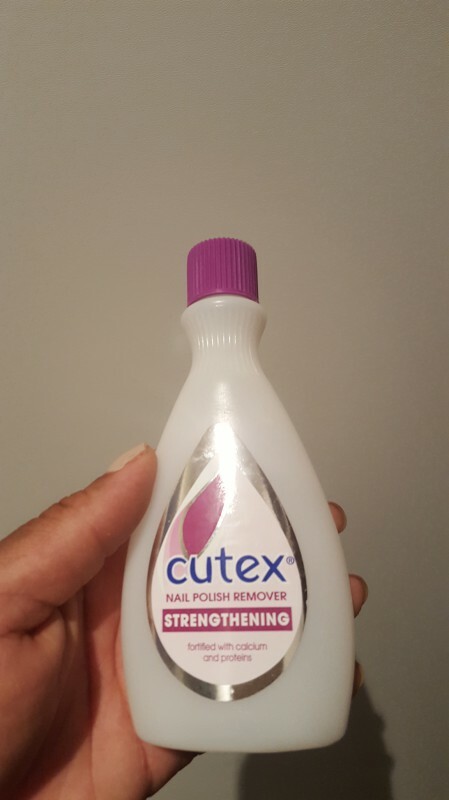 Cutex remove nail polish effortlessly - if you have a busy life and don't have time to waste trying to remove nail polish, well then this is the one. Trusted brand of many years. Well if you live your life in the fast lane like myself , you dont have time for fuss ,basically this product works from the first swipe and leaves nails clean no hassles. 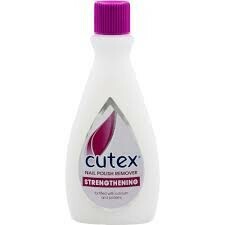 The best nail polish remover.. Cutex is the best.. Keeps my nail strong and healthy... I don't have to rub it hard on my nails to remove the polish.. Just wipe easy and you're done?? i've been using Cutex for years and it's a brand i trust and recommend... good value for money, works effectively, removes the colours completely and smells great. it leaves nails strong too. The only nail polish remover I use ? I love using Nail polish, even with the darkest nail color, It does remove it effortlessly. I will never change. I absolutely love testing out varieties of different nail polishes-mattes,metalics,glitters,nudes you name it! What makes trying out different nail vanishes so hassle free is the Cutex remover I use between trying them all out. Cutex has formulated a milky like substance that easily removes the toughest of vanishes. The packaging is clear and concise about the product and it is easily to get your hands on a bottle or two if you go through remover like I do at your local Dischem and Clicks stores aswell as selected supermarket chain stores. Cutex removes nailpolish effortlessly. It avoids a waste of time as it does not require you to work hard at the nail to remove the polish. It lasts a really long time and is also super effective for removing other substances such as glue from your hands. 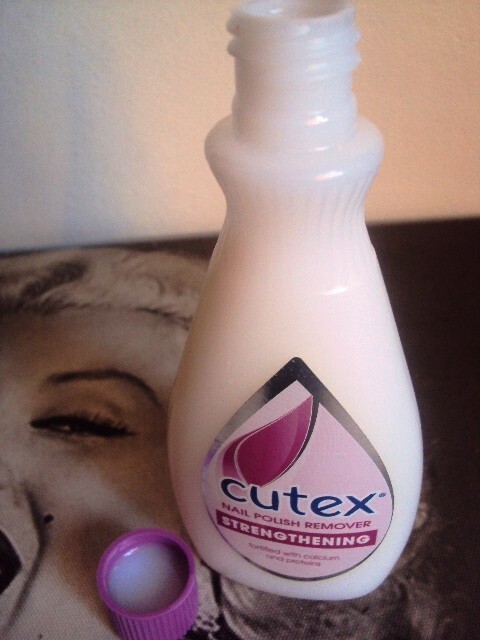 I've used the CUTEX nail polish remover for many years until I started noticing the cheaper brands which offered much bigger bottles at the same price as these small sized CUTEX brand ones so obviously it seemed like a better bet because a bigger bottle was bound to last much longer. I have been using this product for as long as i can remember, i have never used another brand of nail polish remover, removes polish well, no struggling at all, definitely my go to remover. Absolutely the best nail polish remover on the market, I simply can't live without it, it's easy to use, affordable and the smell isn't as harsh as other nail polish removers. -the smell is not harsh or to strong. - different varieties for different needs, - stubborn colour, acetone free. -easy to find. Spar, dischem, pick n pay, clicks, checkers. -nice compact bottle that makes traveling a breeze. Extremely effective at removing nail polish. Best used with cotton rather than with tissue. I've been using this product for as long as ive been using nail polish!It removes nail polish easily without a hassle and is affordable,also doesnt leave my nails dry after removing nail polish. 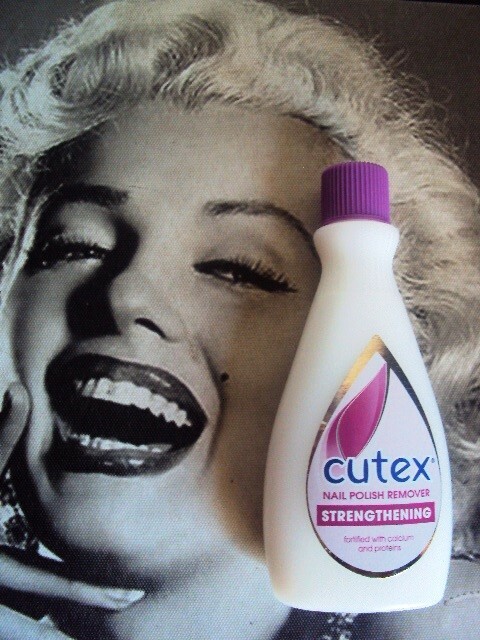 I have been using Cutex nail polish remover for years now! I am so glad someone uploaded it for a review! This is the best nail polish remover I have ever used, I'm sure I have been using it since I was a little girl and my Mom painted my nails and I haven't left the brand since. 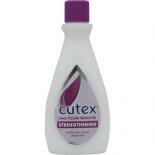 I have tried other nail polish removers but I always bought my trusty Cutex brand either way! An amazing product which will never disappoint! There's a reason "cutex" is a universal word! This will always be a fantastic nail polish remover. Easily removes nail polish with 1-2 swipes. Personally, prefer acetone free nail polish removers. But this product works out just fine. I've been using it for years don't see myself stopping anytime soon. This is my nail polish remover of choice because it doesn't cost that much and it works really fast. I only use one cotton pad so there is no wastage and it removes colour and leaves nails white. Would definitely recommend. This is a pretty good nail polish remover which is effective without drying out my nails. Noticed that after using Cutex, my nails tend to be whiter which is a huge plus. Cutex will definitely be staying on my beauty shelf... a must! It?s always fun putting your nail polish on, but not so great taking it off. Cutex is a trusted brand to the extend that my family even refers to any nail polish as "cutex" . I love this it removes nail polish easily without a fuss. 10/10 for CUTEX!!!! I love this product because it removes nail polish without too much fuss. it also smells great and makes your nails stronger. It is a highly effective product so I get to use little of it because of its high efficacy, I did not really notice a strengthening effect on my nails. Chipped nail polish is not a good look so this right here is life! I keep buying this one! I love Cutex nail polish removers! From time to time I will try another one and I always keep coming back to this one. Its quick, super effective and not as harsh to the skin around your nails as I have found others to be. Being a lady that loves pretty nails 24/7 I was pretty delighted when i came across the Cutex brand. The nail polish remover worked efficiently without much rubbing and damage to my nails or cuticles. The remover worked fast and removed the nail polish without leaving any sort of residue. The smell wasn't too hard on the nose which made nail polish removal a walk in the park. Quick removing, no fuss, no bleeding, and most importantly no damage and weakening to the nail. Something every girl should have! It is the brand i knew from my mom and aunts ... to cut the long story short everything by CUTEX you can trust. Not harsh on the cuticles. This has always been my go to brand when it comes to nail polish remover . I think it just stuck with me because all the ladies in my family use it . Its highly nourishing and doesn't leave the nail dry .Removes polish effectively without needing to use a lot of the product . All time favorite and always affordable ! When I saw this brand of nail polish remover I would usually walk past it, as I wasn't familiar with this product. One day I ran out of nail polish remover and asked my mother to buy me some. She came home with this brand and I sort of was forced to try it out. When I try it out to remove my nail polish I was amazed at how good it worked. It immediately removed it without hassle. The only downside of it is the fact that it has a very strong smell , it's the only thing I don't like about it. Been using this forever ! It does its job beautifully and is a cut above the rest. I've tried others but they don't work as well as Cutex. This is the ultimate,affordable nail polish remover. Cutex has been around for many years and is definitely one of the more trusted brands out there. I personally only buy this nail polish remover and avoid using cheaper lower quality makes. However that being said, I don't find much difference between the different Cutex bottles. My nails don't seem to be any stronger after using this as compared to using another one such as the Cutex Nourishing Remover.